Let's all take a break from our busy lives to celebrate some notable suicide ganks that took place between March 3rd @ 00:00 EVEtime and March 9th @ 23:59 EVEtime. Shall we? Let's start with this fine Orca kill. The rebel in question was jd655, a fairly bot-aspirant name. He lost his Orca to a team of 10 New Order Knights: Capt Starfox, Manny Moons, John E Normus, Wescro2, Spine Ripper, NoseCandy, Dr Tyler, Sara Angel, Kainotomiu Ronuken, and Fawn Tailor. Everyone in the group flew Catalysts--except for the requisite special snowflake, a Coercer flown by Kainotomiu. What's this? A second Orca kill in one week? 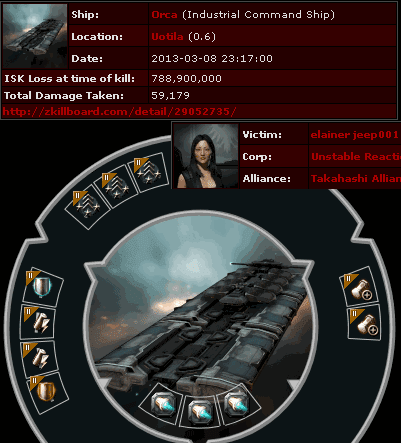 Impressively, elainer jeep001's Orca was killed during an improvised, on-the-fly op. It's interesting to note how similar elainer's fail-tank was to jd655's (and in the same system, no less). elainer was killed by a team consisting of only 9 Catalysts: Capt Starfox, Dante Lobos, Fawn Tailor, Wescro2, NoseCandy, Sara Angel, Pestario Vargas, Jackee Sparrow, and Sir Uchuu. 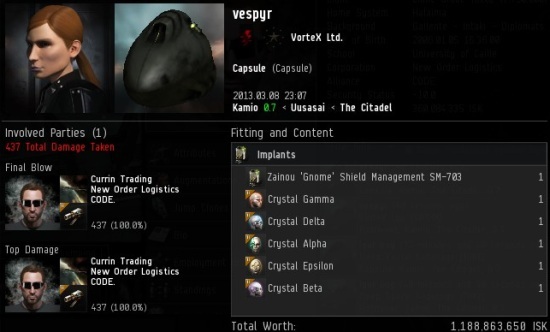 You might wonder how a Covetor could be worth over 360 million isk. Well, you see that mining upgrade without the tech II indicator? 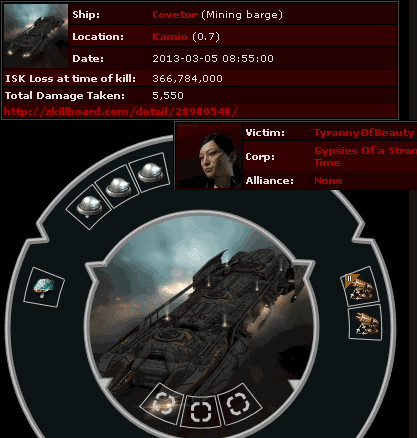 That's an Ingenii Ice Harvester Upgrade, and it's valued at 325 million isk. And it dropped, so our suspicions of the Loot Fairy's membership in the resistance is lessened somewhat. TyrannyOfBeauty learned her lesson (or maybe not) when she lost her fancy Covetor, courtesy of Capt Starfox and Pestario Vargas. I'm beginning to notice a pattern here: All three of the kills so far have had Capt Starfox providing the top damage. And that on the heels of earning his Supreme Protector's Tip of the Hat™, what a week! We can't let Starfox hog all the kills, can we? Clearly, Starfox just has a sixth sense about these things. 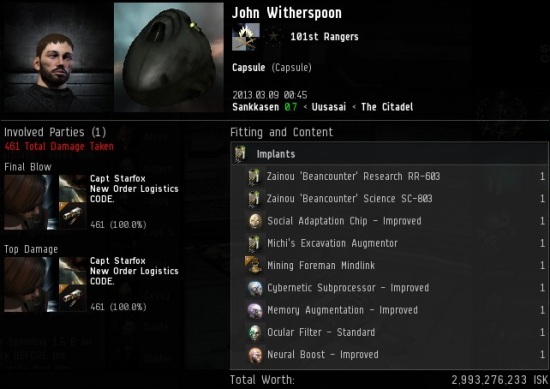 John Witherspoon lost his Hulk for mining without a permit. Knights of the Order Nardieu Nardieu, Capt Starfox, and Pestario Vargas killed the Hulk and Starfox got the podkill. 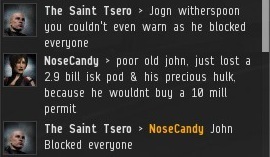 A three billion isk pod is an expensive thing, even for the decadent miners of highsec. Locals were horrified by our Knights' announcement of it. Even resistance fighter The Saint Tsero had to concede that John earned his death. Tsero had attempted to warn him of an impending attack, but it was no use. John was too busy being AFK to talk, so he enabled the "block all" option. Such bot-aspirants do not wish to communicate with anyone, because they think EVE is a single-player game. Thankfully, there is no option to block Antimatter. "Thankfully, there is no option to block Antimatter". For some reason, that line made my day. a 3 billion isk line! My bumping alt had the honor of calling in the strike on jd655 that day. He didn't even have to approach him. He bumped my scouting Procurer in his haste to harvest the last half dozen asteroids in that belt that day. The righteous rebels can only sit by in hope that the theme-parking of Eve will continue getting closer, as it has over the past year. Don't lose hope, o valiant resistance! AFKers let this be a lesson to you. EVE is not a zero-player game. You will be hunted down, exterminated, your capsule cracked open, your corpse defecated upon and your implants burned with sweet incense. Again a fitting fail as regards the Orca's. No Shield Extender, and no new Rigs. Wait...are you accepting non-Catalyst pilots as knights now? I had considered making a ganking alt, but I don't like the look of Gallente ships and would prefer to fly something else.